One hundred years ago this week, on February 6, 1919, the wheels and gears in Seattle stopped turning as tens of thousands of workers in all trades and occupations laid down their tools in one of the nation's first general strikes. The city-wide shutdown grew out of a shipyard strike that began two weeks earlier when 35,000 shipyard workers in Seattle (and 14,000 in Tacoma) walked off their jobs in a dispute over pay raises. The labor movement in Seattle was strong, and the city's Central Labor Council called for a solidarity strike in support of the shipyard workers. Union locals began voting for a general strike, but their goals were unclear. Then, on February 4, Socialist school-board member Anna Louise Strong rallied the local proletariat with a fiery editorial in the Seattle Union Record -- then America's only labor-owned daily newspaper -- and events took on a life of their own. 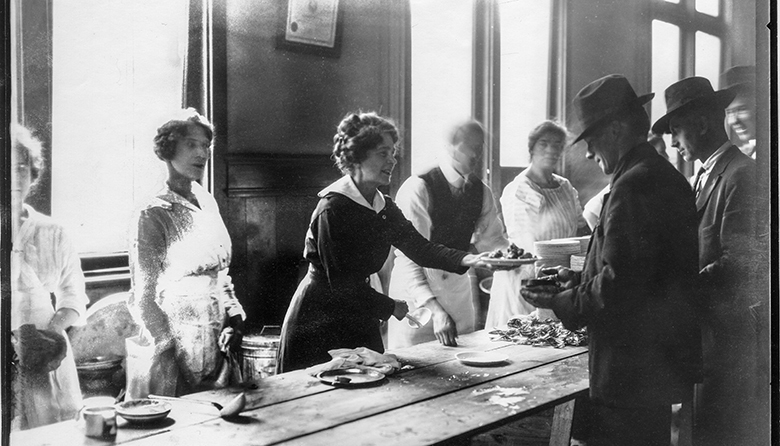 In the first days of the strike, workers organized special committees to maintain essential municipal services and feed the populace, but the initial ebullience of labor solidarity quickly soured. Mayor Ole Hanson and Alden Blethen, publisher of The Seattle Times, called on citizens to turn back what they feared was a home-grown Bolshevik revolution. The strike sputtered out by week's end, and conservative union leaders and government exploited it as a pretext to purge and prosecute radicals across America. The labor movement's left wing would not recover until the onset of the Great Depression. On February 4, 1851, the Oregon Territorial Legislature created Pacific County in the southwest corner of what is now Washington. Located on the mouth of the Columbia River, the new county was already steeped in history as the entry point into the region for fur trader Robert Gray -- the first non-Indian navigator on the river -- and as the destination of explorers Lewis and Clark. The word "pacific" is defined as peaceful or calm, but the mouth of the Columbia can be anything but. Over the years, the county's lighthouses have helped many sailors steer toward safety, while the Fort Canby Life Saving Station and National Motor Lifeboat School have rescued some who did not. But Pacific County’s main claim to fame is its oyster business, which aided in the creation of the Ports of Ilwaco, Peninsula, and Willapa Harbor. Forestry and fishing have also boosted the county’s economy, as has tourism in communities like Raymond, South Bend, and especially Long Beach, which has been a resort community for more than a century. On February 4, 1889, the town of Roslyn incorporated in Kittitas County, only to lose that status later in the year when Washington achieved statehood and territorial incorporation laws were declared unconstitutional. The bustling mining town reincorporated in 1890. February 2, 1903, The Seattle Public Library opened its first branch, in converted apartments in Fremont. The branch moved from these humble beginnings to its current location in 1921. This week also marks anniversaries for three King County libraries. The Federal Way Regional Library was dedicated on February 1, 1992, Woodinville opened its first modern library exactly one year later, and on January 31, 2009, a new Carnation Library was dedicated on the site of its previous building. At the beginning of the twentieth century, residents of the small but growing San Juan Island community of Friday Harbor were in need of a safe and dependable water source. Some suggested that incorporation would help solve their problems, but not everyone agreed. An election was held on February 2, 1909, to decide the issue, and the incorporation measure passed, 70 to 55.